Web developer, entrepreneur, non-profit board member, free/open source software contributor, community facilitator, speaker, and an author. Co-founder of Found Line, a creative studio with capabilities in web development, web design, and print design. Board Member at Vermont Community Access Media, a non-profit community media and technology center. Member of the Telecommunications Advisory Committee for the City of Burlington, Vermont where his role is to advise the City Council on matters related to Burlington Telecom, a municipally owned telecommunications services provider. Minor contributor of source code, bug reports, or documentation to several free/open source projects including PHP and Zend Framework. Organizer of the Burlington, Vermont PHP Users Group. Co-organizer of Vermont Code Camp. Spoken at SXSW Interactive, OSCON, OSCON Data, the jQuery Conference, ZendCon, and CouchConf. Author of Writing and Querying MapReduce Views in CouchDB and Scaling CouchDB, both published by O’Reilly Media. Blogs at bradley-holt.com and can be found on Twitter as @BradleyHolt. Co-founded creative services company in 2005. Organizational capabilities include web development, web design, and print design. Specialize in iteratively developing the standards-based and accessible web applications needed by our clients. Built and maintain the homepage for Vermont Public Radio (VPR) as well as the classical and business underwriting pages. Imported existing articles from a proprietary content management system using the Atom Syndication Format into a content repository built using open source software including PHP, Zend Framework, and CouchDB. Integrated articles, municipal minutes, and commenting features for VPR’s Public Post, a news source designed to surface important issues at the local level. Developed and maintain Common Good Vermont in partnership with CCTV Center for Media & Democracy. Since its initial launch in December of 2009 the site has aggregated over 150,000 articles, blog posts, tweets, bookmarks, and events on a wide variety of topics of interest to Vermont’s nonprofit and independent sector. Multiple iterations of the website have launched since its debut. Created and maintain a custom e-commerce web application for ThinkFlood, a consumer electronics company. Integrated multiple third-party APIs including credit card processing, fulfillment, and address validation while still providing a streamlined and simple checkout process for users. Worked closely with ThinkFlood since the initial launch in June of 2009 to extend the web application’s functionality. Co-founded users group and responsible for organizing meetings, promoting events, and encouraging participation. Meetings have been mostly focused on presentations with a handful of social events. Topics discussed at meetings include CSS, SilverStripe, web performance, database optimization, data modelling, unit testing, beginner & intermediate PHP, Zend Framework, Magento, document databases, distributed version control, object-oriented PHP, security, PHP 5.3, load balancing, message & job queues, deploying PHP applications, CouchDB, and Symfony 2. Helped the Vermont .NET User Group organize Vermont Code Camp in partnership with the PHP Users Group. The first Vermont Code Camp in 2009 attracted 89 attendees with 19 sessions. The second Vermont Code Camp in 2010 attracted 125 attendees with 25 sessions. The third Vermont Code Camp in 2011 attracted 158 attendees with 26 sessions. Elected by its members as a Board Member of Vermont Community Access Media (VCAM), a non-profit community media and technology center that provides local citizens access to training and state-of-the-art digital video tools as a means of personal, political, and artistic self-expression. Worked with outside consultants to perform a community needs assessment and develop a strategic plan. Addressing the role of public and government access in a world of new media. Elected by the Board as Secretary and appointed to the Executive Committee and Marketing Committee. Appointed by the City Council of the City of Burlington, Vermont to the Telecommunications Advisory Committee. Role is to advise the City Council on matters related to Burlington Telecom, a municipally owned telecommunications services provider. Created and maintained software applications used to collect and report on infant health care data for the purpose of health care improvement. Developed Windows Forms applications using the Microsoft .NET Framework and MS SQL Server. Promoted best practices within the development team by introducing and providing education on new tools, technologies, and processes. Defined a modular architecture for the organization’s first major .NET application based on the Composite UI Application Block (CAB). 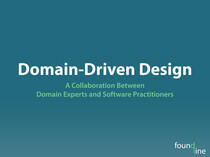 Mentored fellow development team members on applying object-oriented analysis and design, design principles, and design patterns to their software development tasks. Introduced and implemented best practices such as source code management and bug tracking integration, unit testing, code coverage, continuous integration, documentation management, and an iterative release management process. Contracted to teach software applications, network administration, and software development for The State of New Hampshire, Daniel Webster College, BAE Systems, and Broadcom among other organizations and individuals. Constantly learned new technologies to provide the most up-to-date knowledge and information to students. Organized course scheduling, evaluated computer hardware and software requirements, and selected appropriate training materials. Worked with the Division of Personnel to develop new training programs for employees of The State of New Hampshire. Maintained and expanded various corporate contracts by providing high-quality training and client communications. Consistently obtained exceptional ratings on instructor evaluations. 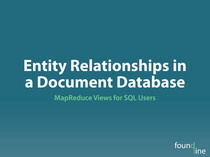 Learn how to create MapReduce views in CouchDB that let you query the document-oriented database for meaningful data. With this short and concise ebook, you’ll get step-by-step instructions and lots of sample code to create and explore several MapReduce views, using an example database you construct.